My newest class for Skillshare, Pen and Ink Calligraphy: The Art of the Envelope, is live and I'm really excited about it. Covers all the steps for envelope addressing, from inks and how to mix and match colors, choosing papers, technique and logistics, plus considerations for working with clients. 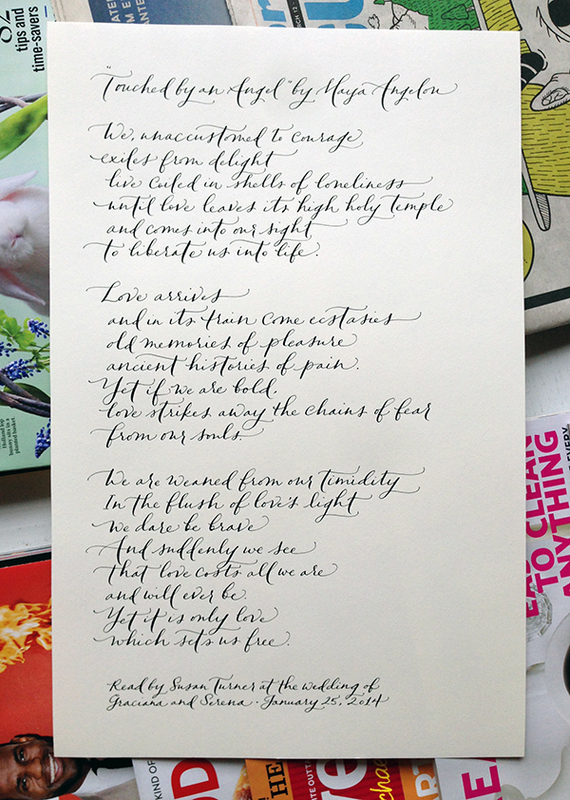 I had a chance to speak with the editorial team of The Knot to help brides-to-be with their calligraphy questions and make some suggestions for those who want to try their own hand at wedding calligraphy. My dear pal Angie Smith is a wonderful photographer -- she came to see the Paperfinger studio last week and shot this scene of me working. There is about 8 months of baby bump hiding in the shadows under my desk. :) I'm still working away for another few weeks...and what a treat to have a treasured friend come visit. This week, I'm filming a three-part workshop series with the Skillshare.com team -- yahoo! They do a wonderful job of offering reputable, interesting and varied online workshops with professionals in a mix of fields. All instructors are selected on an invite-only basis so I'm thrilled to be a part of it -- plus the site technology is really slick, clean and easy to use. I'll be sharing the news as soon as my classes go live! To be notified by email, sign up at the bottom of this page. This is a scan from some of today's writing for some new workshop curriculum. This is a taste of what my process looks like: writing various phrases that I then scan and place into page layouts, which then become class worksheets. This way I can cross out any versions I don't like and just crop out the ones I do. Jen Campbell of Green Wedding Shoes was invited by the team at Vera Wang to create an inspiration board based on the launch of the new pink collection from Vera Wang Fall 2014. Very happy to see that Paperfinger's gold calligraphy menu was featured on the board! I came together with a team of some of my favorite peers for Blair and Ron's wedding in Long Island City, Queens at the beautiful Metropolitan Building. DM Events designed and planned the affair, photos by Mel & Co., and sweets by Nine Cakes. Explore more photos at the gallery here. For a little early spring cleaning, we're offering some of our design stamps at brilliant discounts of around 40-45% through One Kings Lane today, ending Saturday. If you're new to OKL, sign up through this link and receive $15 credit immediately!